The Thomistic Institute held held a symposium, named above, at New York University’s Catholic Center. Your roving reporter was there. Here is a brief, a very brief, account, of course shaded by my interests. First and importantly, and because the Big News of Pope Francis’s latest tome had only come out only the day before, none of the speakers or moderators said anything1, except in passing, about Amoris Laetitia. It was in the air, however. Munoz, a lawyer, has been arguing with what he called “neo-Catholics” or “paleo-Catholics”, folks who hold the position that the rot we see about us was present in the foundation of America. Munoz countered by showing documents from Jefferson, Hamilton, Madison, and so on, in which words like “Creator” and “Providence” appeared. Munoz claimed that the presence of these words indicated that our political system was constructed on the stones of objective truth, natural law, and teleology. All of these, it is emphasized, Munoz agrees are necessary for the functioning of a moral and civil society and which are now missing. In the examples Munoz selected, Hamilton came out best, and, as readers might expect, Jefferson worst. Munoz, though, thought Jefferson’s use of Christian-like terms meant that Jefferson believed in the ideas behind these terms. But could Munoz have read Jefferson’s version of the Bible, in which all the bits which tie Jesus to objective truth, natural law, and teleology have been stripped away, leaving only a social justice warrior’s primer? Plus, Jefferson, and Munoz, were rather too keen on equality, a difficult subject (about which more Wednesday). A goodly portion of the audience did not think Munoz made his case. But, again, Munoz was entirely with the room on our present dismal state and on the necessity of the metaphysical troika. Weigel, a well known Saint John Paul II scholar, said “metaphysical boredom” leads to nihilism, which is now widespread. Laws, once the provenance of Congress, have been replaced by “judicial usurpation.” Particularly in the case of Obergefell vs Reality, in which the latter was pierced through by our so-called Supreme Court. Weigel named the author of that opinion, but did not remind the audience that this author self-labeled as a Catholic—perhaps one in the tradition of Murray? The principle of subsidiarity, making decisions at the lowest possible level, and solidarity, JPII’s idea of “civic friendships”, were on the ropes in our march toward centralization and bureaucratic tyranny. Both the State and a majority of citizens now believes that citizens are a “twitching bundle of desires, and that it is the function of the State to satisfy those desires.” Hence gmarriage. How to change this? There are not many options. As Christians, we should remember our baptismal date and live as the first Christians did, hoping our example will be to people now what it once was to people two thousand years ago. Weigel was friendly to “religious freedom”, but it is to be wondered whether, if a sect of Baal worshipers set up shop asking for the freedom to conduct ritual sacrifice, he would be as keen. And don’t forget, dear reader, that Satanists are using “religious freedom” to move into the political sphere. Hanby’s work we’ll come back to at a later date, as it is consonant with our main subject, the philosophy of science. Education is now “dedicated to not thinking about the purpose of our being.” About the tumult in civic life, he quipped, “Who needs a Stasi when you have a neighbor with an iPhone [or other device] handy and ready to destroy your life?” Hanby didn’t mention Murray, but he did say the fears of Murray’s (and of the “spirit” of Vatican II’s) critics, of Christianizing liberalism leading to liberalizing Christianity, have been realized. Hanby tied our post-political totalitarianism into the sexual revolution. How he did so can only be crudely sketched here. He correctly noted that now there are “no bearers of political responsibility”, and that we are instead ruled by a coupled technocracy-bureaucracy. Why? Again, more Hanby later. Perhaps his most prescient phrase was “hidden martyrdom”, perhaps the coming fate of many. Leo XIII, “no fan of democracy”, was like the Owl of Minerva. The famous Hegelian phrase is, “the owl of Minerva begins its flight only when the shadows of night are gathering.” Similarly, Christians say prophecy is only understood as, or after, it is fulfilled. Leo, in other words, was there at the close of the old age, and only saw it for what it was as it was fading. In Rerum Novarum, Leo said “there is nothing more useful than to look at the world as it really is.” Still, Hittinger said Leo and popes up through World War II did not fully recognize or acknowledge the meaning of global capitalism. Leo did grasp that the three great institutions, marriage and the family, the polity, and the church are fundamental. For this reason, Leo thought schools, which is to say Catholic schools, were of prime importance. Today, as readers know, many institutions of “higher learning” which call themselves Catholic have all but abandoned the faith in their race to emulate secular “success”. Pope Francis was the first pope to truly grasp the global aspects of capitalism, Hittinger claimed. Under globalism, States have been suborned to the economic system, which explains Francis’s suspicion of capitalism and of “mediating institutions”. Francis would have the polity subordinate to movements. But who picks the “good people”? This makes us wonder if the Pope knows that unleashing the mob has seldom led to great things. 1 Neither did any speak about the Pope extending the validity of confessions of SSPX priests beyond Year of Mercy, because this wasn’t known at the time. There are a whole bunch of things people don’t understand until after the fact, not because of lack of information, but because they deny the reality of what is happening. I thought policy of churches was supposed to be to God, not movements or economics. Put another way, many protesting “nanny-state” intrusions are here & now saying to some extent saying that the government should, instead of imposing ‘Church-State’ separations (separations that do nothing to impede private Church-sponsored teaching & community influence), instead be more supportive of religion. Laments about such historically trivial obstacles to state-support/mention of religion are the flip-side of a lament FOR nanny-state support of religion. Strange times indeed. Either one supports the nanny-state, or not … but what we see here (as so much elsewhere) is that such support for a personal cause is generally supported regardless of one’s political persuasion. Ken: It’s not a matter of being more supportive of religion. It’s adhering to the constitution. No support is needed, just keep out of people’s religious lives. After all, every time someone mentions abortion or gmarriage, that’s often the first thing that comes out of their mouths. Make the government leave religion alone, as it is supposed to do. “God allows us to experience the low points of life in order to teach us lessons that we could learn in no other way”. So: a) The disunity of man and his division into many “nations” is a division that is “cosmic, [affecting the entire universe] social and religious”. And there will never be a solution to this disunity, until Gabriel blows his trumpet. Not democracy, not monarchy, not anything Man can craft, ever, will erase and resolve his disunity. Religious disunity, social disunity — the very fragmentation of the entire universe — will be with us for all foreseeable futures (for we know not the day nor the hour…). b) However, the Catholic knows nothing of “total corruption”, let alone nihilism; for within “the nations,” these shattered remnants of reality, “part by part”, God continues His work, through the Cross and sacraments of Jesus, who was sent to give the Holy Spirit. c) In CCC 56-57, the word “economy” is being used in a technical theological sense (“divine economy,” “provisional economy”). The “provisional economy” being referred to is the existence of some real but partial unity of Man in “the nations”. These partial unities of men remain open to God’s saving work under the Headship of Christ the King, Christ the Bridegroom of His one, holy, unified Church — if they so choose, if they do not give themselves over to pride and envy of God. e) But rather than be tempted to despair or nihilism, the Catholic is much more free to look honestly at every “provisional economy” of men, since he knows that as a person, he is a citizen — and simultaneously, ineradicably, not neglecting either — of both the City of God and (some, actual, particular) city of Man. Hi William: I also attended the Symposium, and posted a much more polemical review (with a bit of humor thrown in) at http://catholicvitalism.com/notes-from-the-future-of-catholicism-symposium-the-thomistic-institute/. I have great skepticism about the Neo-Conservative Catholic Project espoused by Munoz, Weigel, Hittinger, and Mary Eberstadt, one of the moderators: that Project, initiated by the ‘First Things’ crowd back in the 80s, fantasized about a ‘Catholic Moment’ in which American democracy and capitalism would provide fertile ground for a flourishing of religious faith. The shallow optimism of that project seems to have descended into bitterness in most of the presenters, though I perceive that First Things, under the leadership of Rusty Reno (the other moderator of the Symposium), is trying to shift its stance to avoid becoming simply cranky and increasingly irrelevant. I was tremendously invigorated by Michael Hanby’s presentation, which to my mind was the only one which had the depth necessary to address our current crisis. I enjoyed your post about the Symposium, and look forward to hearing more from you about Michael Hanby’s thesis. “American Catholicism” is almost an oxymoron, but that’s a subject for another time. Until the Church stops drawing from “celibate” males to be priests it will continue to self-destruct… and clinging to archaic, trivial, self-serving rituals doesn’t help. I s’pose attendees would be far happier if we all still believed in a flat Earth, the sun revolving around it, had slaves doing our work, and women were kept barefoot and pregnant. But, progress happens (painful and disagreeable as it is for some). Every generation has delusional types and small minds who think the world is coming to an end in their lifetime… and yet, lo-and-behold, the world keeps on going and going and going and going… and going and going… and… (well, until the Sun turns into a red giant in a few billion years). Shecky, you seem a little bitter. I think Catholicism in America will continue to dwindle for some time. The pedophilia scandal is still fresh in the minds of many people and understandably so. It was beyond a few priests here or there. It was known to the Church and was part of a system that regularly attempted to mitigate damage to the Church. The Scandal along with the general turn toward apathy/agnosticism/atheism will further shrink the Church for another generation. But there is some segment of American society that by and large seems inclined toward one Christianity or another and I don’t see the Church vanishing from the US. 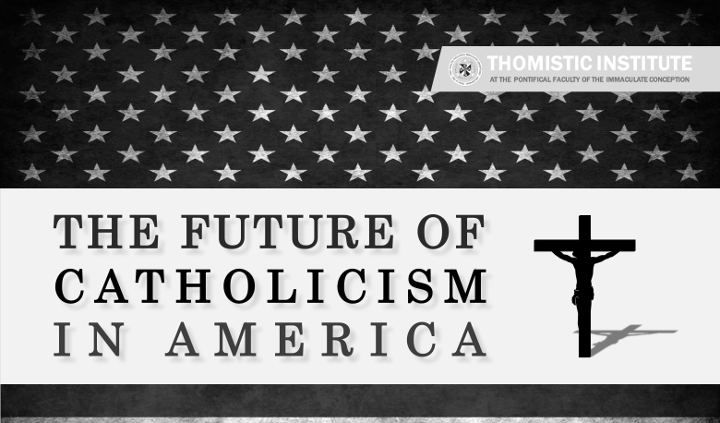 The future of Catholicism in American is not bright. You know it, and those speakers know it. Telling people that they need to think about the meaning or purpose of their life doesn’t help. Blaming it on college education doesn’t do any good. I doubt that college education heavily influences one’s religiosity. I don’t have any evidence for my claim, just like there doesn’t seem to be any evidence for many claims stated in this post. It’s a good thing that being atheists are more acceptable now, imo. Perhaps, one can study why the Catholic population is increasing in African and Asia. Or perhaps, more immigrants from Latin America can help. I have never said that being atheist is unacceptable. One of the people I love most in the world is an atheist. Some of my friends are atheist or agnostic, although that’s a puzzle to me so I say an agnostic is not an atheist. Perhaps your experience has been different. I can imagine it has. Take Christopher Hitchens: According to John Lennox, his world view was formed early when he discovered the dead body of his mother and a priest having committed a double suicide. Not a good advert. People come to their conclusions for many different reasons and with that in mind I see him in a different light. I still wish he hadn’t gone about the way he did but some good will come of it because now everybody’s talking about it again. Drat, I missed the podcast now.